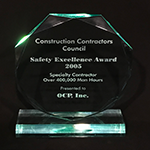 OCP Contractors' places safety at the foundation of all processes. 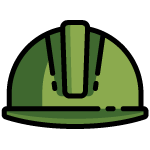 In an effort to maintain strict safety standards, OCP enforces a 100% safety glasses, hard hat, and gloves policy on its employees, subs, and suppliers while on the work site. To consistently innovate process for safety, OCP maintains a safety committee in each key market. 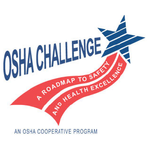 In 2009 OCP became an OSHA Challenge Graduate, alongside only 34 other contractors in the United States that value constant improvement in health and safety management through mentoring, traning, and progress tracking. 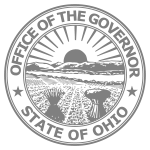 Additionally, OCP participates in the OSHA Voluntary Protect Program (VPP). 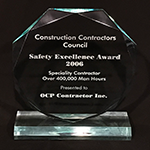 OCP Contractors has three full time safety professionals on staff with a combined experience of over 50 years. 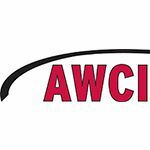 The staff is supported by three safety committees comprised of members from all employed trades and management. 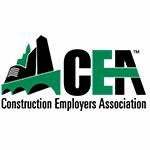 Furthermore, All OCP employees (field and office) are required to obtain their OSHA 30 hour Construction Card within 60 days of their hire. 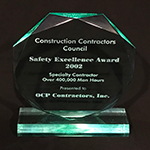 OCP Contractors believes its employees are its most important asset. 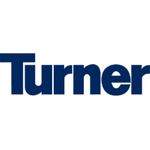 To ensure every employee goes home injury free, we will supply them with the highest quality of programs, training, and equipment. OCP is committed to keeping communication open at every level and maintaining employee involvement. A SAFE WORKPLACE IS A SUCCESSFUL WORKPLACE.